Classic! A super-soft chenille plush stuffed animal. So cuddly you’ll never want to put it down! This happy stuffed product is designed for baby gift, the sun, the star all are carefully added to pleased baby. Warm! This MINIONS folding plush pillow brings impressive character to life for super sized fun! he converts to a comfy pillow for , naptime, bedtime, travel time, or any time! Romantic! Love words in the heart, Oh, wonderful dreamy lavender, at first of glance, you'll be fall in love with it! Romantic! Snow white! Love words in the heart, Soft touch like lovers finger, sweet heart, this is a amazing surprise! WOW! Huge squeaker AND a tennis ball in the head AND the thickest pile corduroy available - jackpot! ! ! Four styles, each available in one size. Long! Cuddly! Squeaky! These big fellas crinkle when stretched out and have two huge squeakers in either end. The thick pile material is lined with Denier Laminate Protection for extra durability and tons of fun! 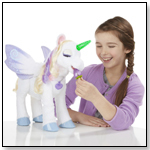 The pet of any girl's dreams is here: the StarLily, My Magical Unicorn toy! StarLily is a beautiful young unicorn who's come from her home in an enchanted forest to become a very best friend. She responds to voice and touch with more than 100 sound and motion combinations! When interacting with her, she moves her head and hoof, makes special sounds, and lights up her horn. Noelle has a fresh peppermint scent. From our award winning Groovy Girls collection. Soft 13" doll features embroidered facial features and hands. Outfit is removable and attaches with a Velcro-like closure on back. Scent Technology by Celessence - an innovative micro-encapsulation delivery system. Gently hug doll to release scent. Aurora’s popular Sea Sparkles™ line features over 80 trend-setting styles of enchanting and trend-forward mermaid dolls and sea-friend plush that make a splash with families wherever they go. Their newest collection of 6 mermaids called Sea Shimmers™ have stylized long-flowing doll hair infused with shimmering mylar, sparkling crowns and new outfits. Aurora World's My Little Pony® line this year sees the addition of Princess Celestial, complete with multi-colored mane and sparkles aplenty - an absolute must-have for the most devoted My Little Pony fans! Aurora World is the only company making My Little Pony plush beyond the core characters. This year marks the Centennial Anniversary of Raggedy Ann, the iconic rag doll beloved by generations. Aurora World is celebrating this eventful occasion by launching new, Special Edition Stars and Stripes Raggedy Ann and Raggedy Andy dolls. The handmade, 16” dolls feature all-American apparel: white stars against a dark blue background, combined with red. The 100th Anniversary is embroidered on Raggedy Ann’s apron and Raggedy Andy’s cap. Known for hair made of red yarn and a triangle nose, Raggedy Ann was created in 1915 as a doll and introduced to the public in the 1918 Raggedy Ann Stories, the first in a series of children’s books featuring the character by American writer Johnny Gruelle. When a doll was marketed with the book, the concept had great success. In 1920 a sequel, Raggedy Andy Stories, introduced the character of her brother, Raggedy Andy, dressed in a sailor suit and hat. Each Slushy bear is handcrafted and hand painted, along with all the products from Aurora’s award-winning Miyoni collection, so no two animals are the same. White as snow, Slushy is a soft and huggable 16-inch polar bear that will melt your heart. He’s sure to keep little ones warm at night, whatever the weather. Twinkle Collection (Twinkle Floppy Fawn, Twinkle Hedgehog, Twinkle Standing Fawn, Twinkle Polar Bear and Twinkle Owl) – Special Glitter fibers knitted in the plush make this lovely collection Magically "Twinkle"
Whether he's flaked out on a rock or scurrying under one, there's no mistaking the extraordinary Folkmanis® COLLARED LIZARD puppet. Visually stunning and surprisingly soft to the touch, this wonderful North American creature comes to life with movable head, mouth, forelegs and tail! Yes, you "herd" right; a new BLEATING SHEEP puppet grazes in Folkmanis pastures. 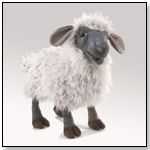 With her sweet, comical face and soft, silvery fleece, this is one puppet "ewe" will surely love. Animate her mouth as you gently squeeze her body to hear her bleat. Looks like someone’s been scrabbling about and making all kinds of mischief! 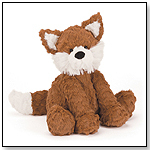 Fuddlewuddle Fox has been on so many adventures, he’s made ruffles all through his soft, gingery fur. Give this feisty fellow lots of scruffles and strokes, and maybe he’ll show you how to dance the foxtrot! — In a June 2015 survey, two out of 10 retailers told TDmonthly that Jellycat was their best-selling plush brand. 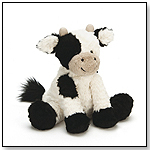 Muddly, cuddly Fuddlewuddle Calf is so loveably ditzy! He’d forget to put his horns on if they weren’t attached! We all love him though, with his black and white splotches and merry Jellycat grin. Soft as silk and fond of milk, this scamp has a big heart and lots of love to give. These scented backpack clips are shaped like foods. 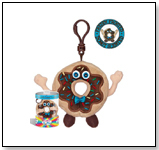 Pictured: Freddy Frosted: I'm chocolate donut scented! — Deran Muckjian, owner of Catch a Falling Star in Lexington, Mass., told TDmonthly in a June 2015 survey that Whiffer Sniffers are their store's best-selling plush. Other products from GUND INC. This cute little 1 piece, palm size porcupine set from Gund will put a smile on your child's face. Each porcupine measures 3" in height with a plastic nose & stitched eyes. Each porcupine has soft velour face & paws with the lighter of the two having a soft velour stomach as well. Both porcupines have salt & pepper colored long hair. — In a June 2015 survey, two out of 10 retailers told TDmonthly that Qwilly porcupine was their best-selling plush toy. 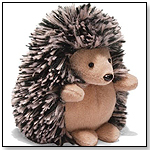 This prickle of hedgehogs from GUND is a ball of cuteness. Super-soft and fluffy with sweet little faces, they're fun to cuddle, toss, and tote. Set includes three hedgehogs in dark brown, light brown, and charcoal. For ages 12 months and up. Size 3"
— Dean Smith, owner of Jazams in Princeton, N.J., told TDmonthly in a June 2015 survey that Ganley the Hedgehog was their store's best-selling plush brand. Product Description: Birthdaykins are the fun friends in BirthdayLand, the place where birthday wishes come true. Some say Cupcake is one of the most delicious Birthdaykin because she's topped with a yummy golden cupcake! She bakes cupcakes for everyone in BirthdayLand with a big heap of love. Like the rest of the Birthdaykins, Cupcake comes with a special code that unlocks premium features in the BirthdayLand app. The app is a free download in iTunes Store, Google Play and Amazon Apps.